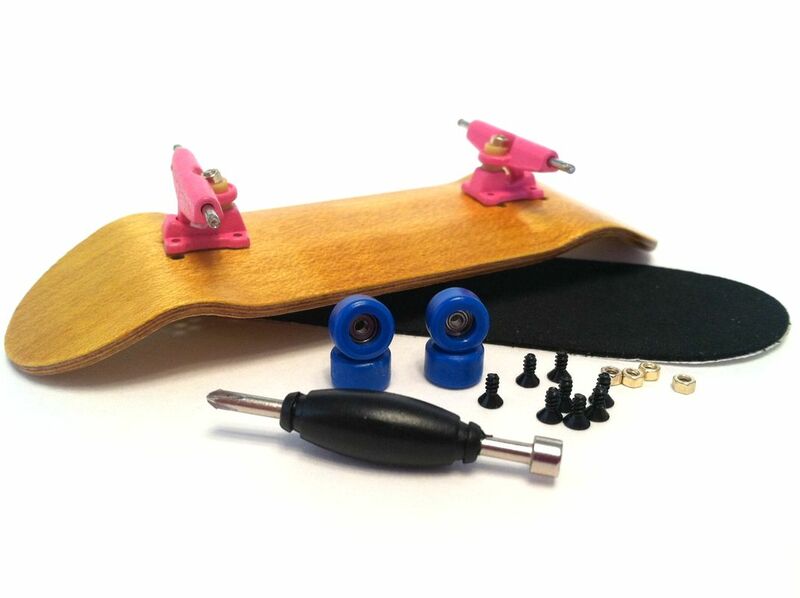 WOODEN FINGERBOARD COMPLETE - FINGERBOARD STORE -WOODEN FINGERBOARD COMPLETES, BEARING WHEELS, RAMPS, WOOD FINGERBOARD DECKS, TUNING, FINGERBOARDING, FINGERBOARD WHOLESALE, FINGERBOARD BAG & MUCH MORE! 5 PLY SFB2 BLUE MAPLE FINGERBOARD. MEDIUM CONCAVE & MEDIUM KICKS. COMPLETE WITH WHITE TRUCKS AND RED BEARING WHEELS. COMES WITH A PIECE OF PRE-CUT SUPREME FOAM GRIP TAPE. 8 SCREWS AND 4 BOLTS INCLUDED. FREE TUNING TOOL INLCUDED. SHRED THIS DECK RIGHT OUT OF THE PACKAGE! 5 PLY SFB2 ORANGE MAPLE FINGERBOARD. MEDIUM CONCAVE & MEDIUM KICKS. COMPLETE WITH PURPLE TRUCKS AND WHITE BEARING WHEELS. 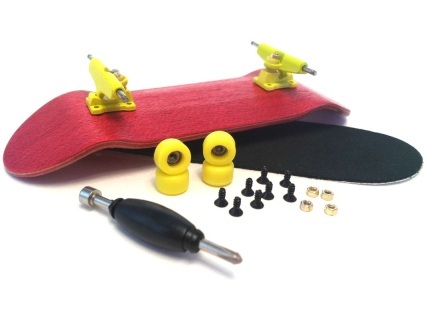 COMES WITH A PIECE OF PRE-CUT SUPREME FOAM GRIP TAPE. 8 SCREWS AND 4 BOLTS INCLUDED. FREE TUNING TOOL INLCUDED. SHRED THIS DECK RIGHT OUT OF THE PACKAGE! 5 PLY SFB2 RED MAPLE FINGERBOARD. MEDIUM CONCAVE & MEDIUM KICKS. COMPLETE WITH RED TRUCKS AND RED BEARING WHEELS. 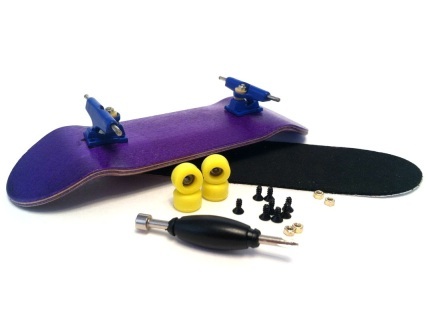 COMES WITH A PIECE OF PRE-CUT SUPREME FOAM GRIP TAPE. 8 SCREWS AND 4 BOLTS INCLUDED. FREE TUNING TOOL INLCUDED. SHRED THIS DECK RIGHT OUT OF THE PACKAGE! 5 PLY SFB2 NAUTURAL MAPLE FINGERBOARD. MEDIUM CONCAVE & MEDIUM KICKS. COMPLETE WITH LIME GREEN TRUCKS AND RED BEARING WHEELS. 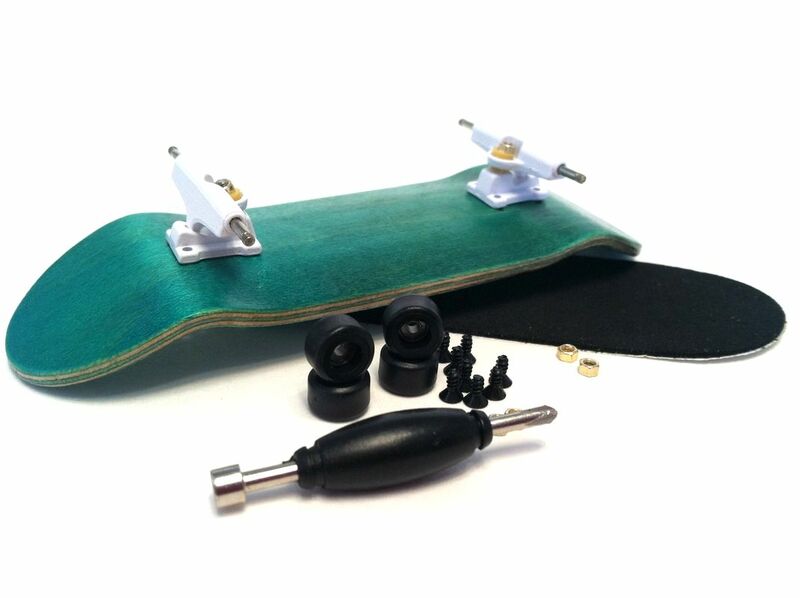 COMES WITH A PIECE OF PRE-CUT SUPREME FOAM GRIP TAPE. 8 SCREWS AND 4 BOLTS INCLUDED. FREE TUNING TOOL INLCUDED. SHRED THIS DECK RIGHT OUT OF THE PACKAGE! 5 PLY SFB2 GREEN MAPLE FINGERBOARD. MEDIUM CONCAVE & MEDIUM KICKS. COMPLETE WITH WHITE TRUCKS AND BLACK BEARING WHEELS. 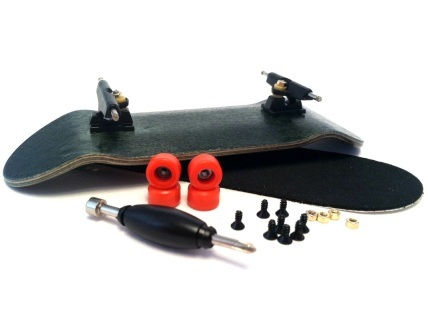 COMES WITH A PIECE OF PRE-CUT SUPREME FOAM GRIP TAPE. 8 SCREWS AND 4 BOLTS INCLUDED. FREE TUNING TOOL INLCUDED. SHRED THIS DECK RIGHT OUT OF THE PACKAGE! 5 PLY SFB2 YELLOW MAPLE FINGERBOARD. MEDIUM CONCAVE & MEDIUM KICKS. COMPLETE WITH PINK TRUCKS AND DARK BLUE BEARING WHEELS. COMES WITH A PIECE OF PRE-CUT SUPREME FOAM GRIP TAPE. 8 SCREWS AND 4 BOLTS INCLUDED. FREE TUNING TOOL INLCUDED. SHRED THIS DECK RIGHT OUT OF THE PACKAGE! 5 PLY SFB2 BLACK MAPLE FINGERBOARD. MEDIUM CONCAVE & MEDIUM KICKS. 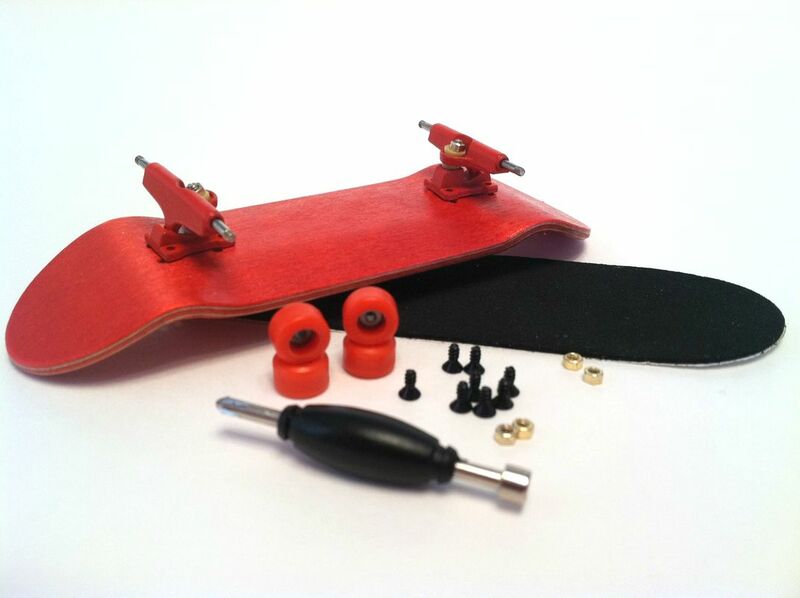 COMPLETE WITH BLACK TRUCKS AND RED BEARING WHEELS. 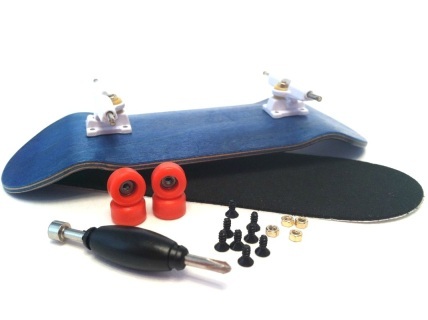 COMES WITH A PIECE OF PRE-CUT SUPREME FOAM GRIP TAPE. 8 SCREWS AND 4 BOLTS INCLUDED. FREE TUNING TOOL INLCUDED. SHRED THIS DECK RIGHT OUT OF THE PACKAGE! 5 PLY SFB2 PINK MAPLE FINGERBOARD. MEDIUM CONCAVE & MEDIUM KICKS. COMPLETE WITH YELLOW TRUCKS AND YELOOW BEARING WHEELS. COMES WITH A PIECE OF PRE-CUT SUPREME FOAM GRIP TAPE. 8 SCREWS AND 4 BOLTS INCLUDED. FREE TUNING TOOL INLCUDED. SHRED THIS DECK RIGHT OUT OF THE PACKAGE! 5 PLY SFB2 PURPLE MAPLE FINGERBOARD. MEDIUM CONCAVE & MEDIUM KICKS. COMPLETE WITH BLUE TRUCKS AND YELLOW BEARING WHEELS. 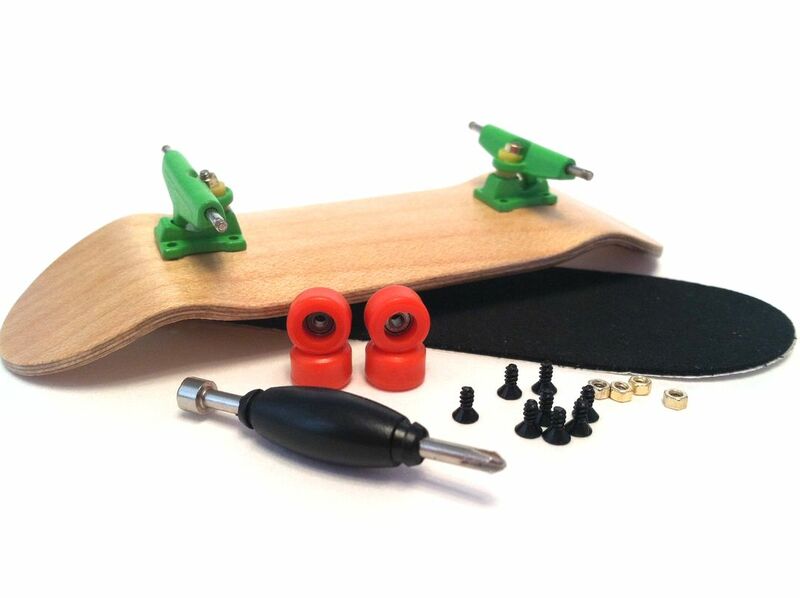 COMES WITH A PIECE OF PRE-CUT SUPREME FOAM GRIP TAPE. 8 SCREWS AND 4 BOLTS INCLUDED. FREE TUNING TOOL INLCUDED. SHRED THIS DECK RIGHT OUT OF THE PACKAGE! 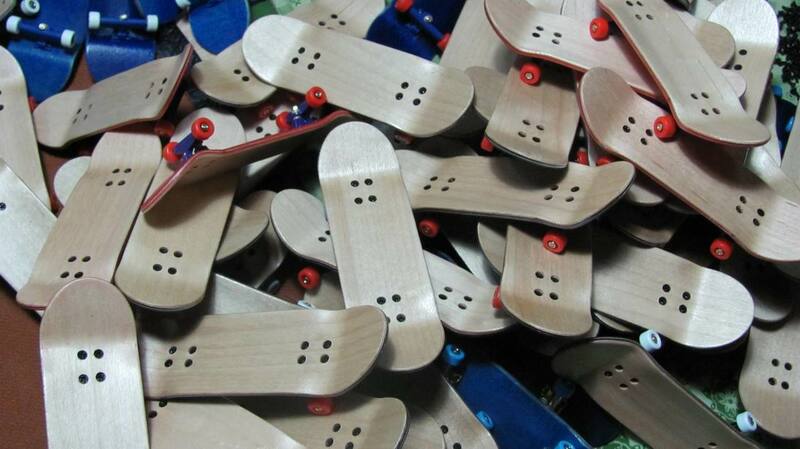 5 PLY SFB2 WOODEN FINGERBOARD. COMPLETE WITH TRUCKS AND BEARING WHEELS. 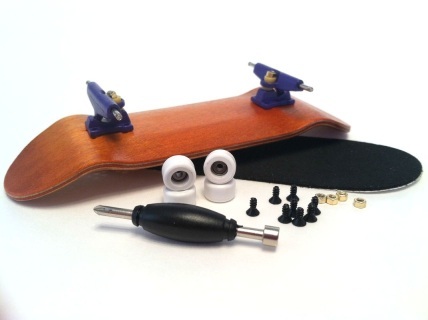 COMES WITH A PIECE OF SUPREME GRIP.. FREE TUNING TOOL INLCUDED. YOU CHOOSE THE COLORS! PLEASE LEAVE A NOTE ON PAYPAL WHEN CHECKING OUT OR RANDOM COLORS WILL BE SENT!